Mordecai Manuel Noah was born with America in the city of our nation's birth, Philadelphia, on July 19, 1785, halfway in time between the signing of the Treaty of Paris in 1783 and the adoption of the Constitution in 1787. in his person, Noah mirrored the new nation-willful, brash, adventurous, creative, combative, yet good-natured and generous. Similarly, his personal life reflected the Jewish community to which he belonged, patriotic and philanthropic, reverential of the religious tradition, respectful and supportive of its institutions yet growing ever more lax in religious observance, and desirous of changes in ritual and liturgy. Mordecai was the first-born son of Manuel Noah, an immigrant from Mannheim, Germany, who had served in the Revolutionary War, and Zipporah Phillips, daughter of Jonas Phillips and Rebecca Machado, whose father had served as hazzan of the Shearith Israel Congregation of New York. Though three of his grandparents were Ashkenazi, Noah stressed his Sefardi identity, for it gave him deeper roots in America and a more aristocratic status in the Jewish community. His association with the rapidly increasing Ashkenazi community grew closer through his marriage into one of that community's leading families and through his leadership, in the 1840s, of the Hebrew Benevolent Society, the united charity organization of a Jewish community now overwhelmingly Ashkenazi. To Mordecai M. Noah, journalism and politics were one career. Journalism he practiced in the service of his political pursuits: political activity he was involved in to reinforce his journalistic enterprises. In the early Republic press and party were in symbiotic relationship. His consulship to the Kingdom of Tunis, his positions as sheriff of New York, surveyor of its port, and judge in its court of General Sessions, and his editorship of half a dozen newspapers were for him all of a piece-a career of public service. In the Jewish community, Noah served as its chief orator, delivering the major addresses at its important communal gatherings. As an accepted interpreter of Judaism to the general community, he informed his audience in newspaper articles and from the lecture platform about various aspects of Jewish religion and history, about Jewish concerns and aspirations. To Americans he was the representative Jew; to Jews, he was the quintessential American; Noah gained from both roles. Noah believed that American and Jewish ideals and interests were congruent and that in his political endeavors his Jewishness was more an advantage than a handicap. 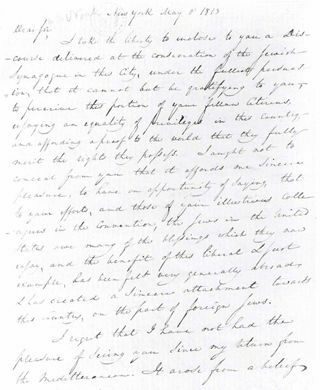 From the time he petitioned for a consulship in 1811 to the time when he sent a letter to New York's Governor Seward in 1849, Noah relied on his Jewish identity to gain him political advantage, reminding the secretary of state and the governor that the Jewish community would appreciate and reward any favors shown to him, as a member and leader of the community. And as the Jewish community increased in numbers and affluence, so too did Noah's political influence and power. He fully believed that, because he was a Jew, his appointment to a governmental position of trust would be a powerful statement to the world both about the status of Jews in America and the nature of American democracy. As he wrote to Secretary of State James Monroe in 1811, his appointment to a consulship would "prove to foreign powers that our government is not regulated in the appointment of their officers by religious distinction." in a world darkened by bigotry, America was for him a beacon of freedom and equality, but his faith was soon tested. The institutions of the United States are the property of the nation. The faith of the people is pledged to their existence. The most distinguished feature in our compact ... is religious liberty-is the emancipation of the soul from temporal authority-we cease to be free, when we cease to be liberal. 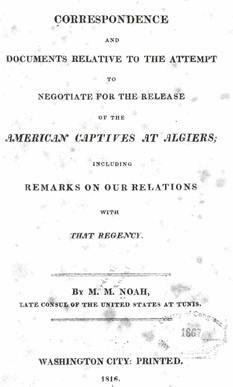 Mordecai M. Noah, Correspondence and Documents.... Washington, 1816. Rare Book and Special Collections Division. At the time of your appointment, as Consul to Tunis, it was not known that the religion which you profess would form an obstacle to the exercise of your Consular functions. My dismissal from office in consequence of religion, has become a document on file in the department of State. This may hereafter produce the most injurious effects establishing a principle, which will go to annihilate the most sacred rights of the citizen. This portrait of Mordecai Manuel Noah appears as the frontispiece of a work describing his brief but eventful tenure as Consul to the Kingdom of Tunis. The Library's holdings also contain the correspondence between Madison and Noah two years later concerning his dismissal. On May 6, 1818, accompanying the Consecration Address, Noah sent a letter to Madison which deserves a wider readership than the few scholars who may seek it out in the Manuscript Division. I take the liberty to enclose to you a Discourse delivered at the consecration of the Jewish Synagogue in this city, under the fullest persuasion, that it cannot but be gratifying to you to perceive this portion of your fellow Citizens enjoying an equality of privileges in this country and affording a proof to the world that they fully merit the rights they possess. I ought not to conceal from you that it afforded me sincere pleasure, to have the opportunity of saying, that to your efforts, and those of your illustrious colleagues in the Convention, the Jews in the United States owe many of the blessings which they now enjoy, and the benefit of this liberal and first example, has been felt very generally abroad and has created a sincere attachment toward this Country, on the part of foreign Jews. I regret that I have not had the pleasure of seeing you since my return from the Mediterranean. It arose from a belief that my recall was the result of very unfavorable impressions made on your mind; if these impressions have existed, I do sincerely hope that they have been removed by subsequent explanations, for I wish you to be assured, and I have no object in view in making the assertion, that no infamy arose in Barbary to the public service from my religion as relating to myself, on the contrary, my influence and standing abroad was highly creditable and flattering. 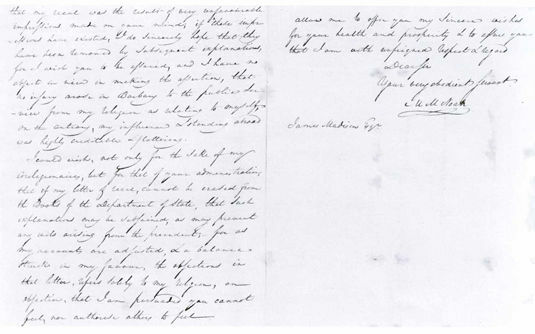 I could wish, not only for the sake of my coreligionaires, but for that of your administration, that if my letter of recall cannot be erased from the Books of the Department of State, that such explanations may be subjoined as may prevent any arising from the precedent;-for as my accounts are adjusted, and a balance struck in my favor, the objections in that letter, refers solely to my religion, an objection, that I am persuaded you cannot feel, nor authorize others to feel. I ought not to conceal from you that it afforded me sincere pleasure, to have the opportunity of saying, that to your efforts, and those of your illustrious colleagues in the Convention, the Jews in the United States owe many of the blessings which they now enjoy, and the benefit of this liberal and first example, has been felt very generally abroad and has created a sincere attachment toward this Country, on the part of foreign Jews. Mordecai M. Noah to James Madison, May 6, 1818. Manuscript Division, Papers of James Madison. As your foreign mission took place whilst I was in the administration it cannot be but agreeable to me to learn, that your accounts have been closed in a manner favorable to you. And I know too well the justice and candor of the present executive [Monroe] to doubt that an official preservation, will be readily allowed to explanations necessary to protect your character against the effect of any impressions whenever ascertained to be erroneous. It was certain, that your religious profession was well-known at the time you received your commission, and that in itself it could not be a motive in your recall. Noah made peace with Monroe, for in the Monroe Papers we find a twenty-page letter from Noah, dated June 23, 1823, urging Monroe's support for William Crawford as candidate for the presidency. Crawford's bid failed, and with it Noah's political and editorial influence waned, but it gave Noah time to pursue a plan he had proposed some five years earlier, the establishment of a Jewish settlement on Grand Island on the Niagara River. 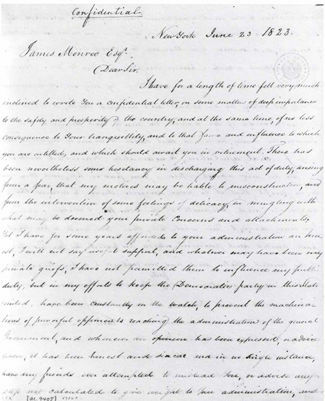 First page of a long political letter marked "Confidential" from Mordecai M. Noah to James Monroe, on "matters of deep importance to the safety and prosperity of the country, and at the same time, of no less consequence to your tranquility, and to that fame and influence to which you are entitled, and which should await your retirement." He asks Monroe's support for the candidacy of William Crawford for the presidency, a bid which failed. Mordecai M. Noah to James Monroe, June 23, 1823. Manuscript Division, Papers of James Monroe. As an American and as a Jew, Noah was constantly looking for points where American and Jewish interests might intersect. In the early decades of the nineteenth century, America's greatest need was for immigrants. In his travels in Europe and Africa, Noah learned that Jews in the Old World desperately needed a haven for themselves and their children. To bring such Jews to a welcoming America would be a signal service to both. The drama Noah staged in Buffalo on September 15, 1825, in dedicating Ararat as "A City of Refuge for the Jews," with men marching, band playing, and "Judge" Noah in regal vestments orating, was for both America and world Jewry. The pageant, the proclamation, and Noah's speech were intended to grab the attention of newspaper editors to whom description and text were sent. Accounts of the Ararat drama appeared in newspapers throughout the United States and in England, France, and Germany as well. The drama presented the Jews as the most desirable citizens a nation could want-able, ambitious, productive, and loyal; to the Jews of the Old World, it portrayed what kind of country America was for the Jews. Political dignitaries, leaders of society, and the general populace joined to celebrate the establishment of a city for Jews, while America's most prominent Jew proclaimed a Jewish state on American soil and welcomed his brethren to settle it. One of the newspapers which published a full account of the proceedings was the National Intelligencer, Washington, D.C. In its September 29, 1825, issue it described the ceremonies attendant upon the laying of the cornerstone, with its Hebrew quotation and English inscription (the stone survives and is now in a museum on Grand Island) and Noah's address. Mordecai M. Noah was not alone in identifying the American Indians as descendants of the Ten Lost Tribes of Israel. The belief was widespread in early nineteenth-century America, a new nation steeped in the biblical heritage, seeking roots in antiquity. Noah took the opportunity in this address to assert his Jewish restorationist sentiments, predicting that "Syria [i.e., Palestine] will revert to the Jewish people." Mordecai M. Noah, Discourse on the Evidence of the American Indians Being the Descendants of the Lost Tribes of Israel, New York, 1837. General Collection. Never were the prospects for the restoration of the Jewish nation to their ancient rights and dominion more brilliant than they are at present ... They will march in triumphant numbers ... and take their rank among the governments of the earth. The Jewish people must now do something for themselves ... Syria [i.e., Palestine] will revert to the Jewish nation by purchase ... Under the co-operation and protection of England and France, this reoccupation of Syria ... is at once reasonable and practicable. The liberty and independence of the Jewish nation may grow out of a single effort which this country may make in their behalf ... they want only protection, and the work will be accomplished. The first step is to solicit from the Sultan of Turkey permission for the Jews to purchase and hold land . . . Ports of the Mediterranean [will be] occupied by enterprising Jews. The valley of the Jordan will be filled by agriculturists from ... Germany, Poland and Russia. Noah wrote these words a half-century before Theodor Herzl wrote Der Judenstaat, and more than a century before the establishment of the State of Israel in 1948. Noah, the Jew, proclaimed his faith that the Jews will return to and rebuild their ancient homeland; Noah, the enterprising American, calls upon the American nation to take leadership in this endeavor, which will fulfill ancient promises and modem needs. In this proto-Zionist classic, Noah proposes a program which became a political movement a half-century later with the convening of the First Zionist Congress, and a reality a century later with the founding of the State of Israel. 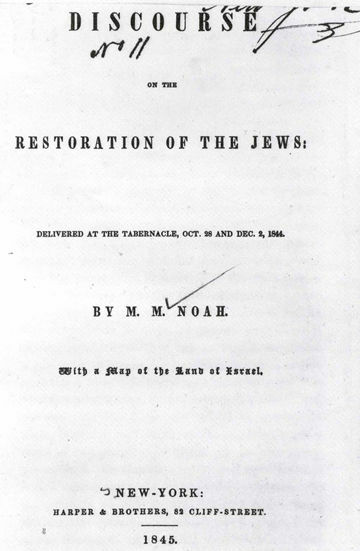 Mordecai M. Noah, Discourse on the Restoration of the Jews, New York, 1845. Rare Book and Special Collections Division. 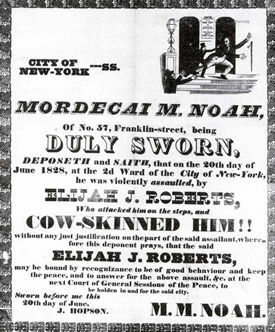 Mordecai M. Noah ... duly sworn, deposeth and saith, that on the 20th day of June 1828 ... he was most violently assaulted, by Elijah J. Roberts, who attacked him on the steps, and cow-skinned HIM!! Roberts was a former business associate with whom Noah had a falling out. At the top of the steps, the purported victim, Noah, pronounced aquiline nose and large in body, has just dropped his formidable walking stick. His accused attacker looks half his size, his weapon, a small and thin walking stick. The entire depiction, especially the theater announcement, seems far more anti-Noah than critical of Roberts. More indicative of Noah is his obituary in the Boston Weekly Museum, where the entire front page of the April 26, 1851, issue is devoted to an account of his life and works and a two-column signed portrait of the deceased. 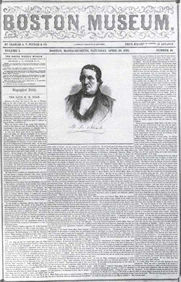 The Boston Museum gave the entire front page of its April 26, 1851, issue to an obituary of Mordecai M. Noah, his bibliography, accomplishments, and contributions, and a two-column portrait. Boston Museum, April 26, 1851. General Collection. In his determined insistence on being part of America's political, social, and cultural life while at the same time participating in Jewish religious and communal life, Mordecai Manuel Noah demonstrated by example that in America a Jew could be both fully Jewish and fully American. As the first to do so publicly, dramatically, and successfully, Noah might well be called "The first American Jew." Sources: Abraham J. Karp, From the Ends of the Earth: Judaic Treasures of the Library of Congress, (DC: Library of Congress, 1991). 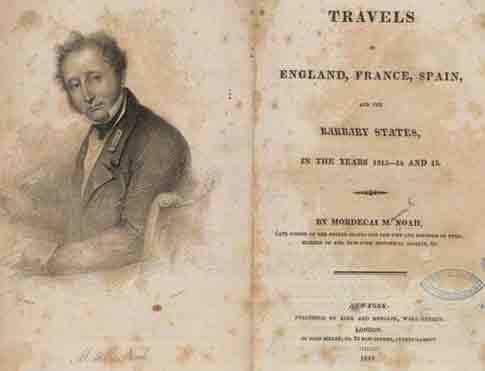 Noah portrait and travel book appear in the Library's From Haven to Home exhibit.